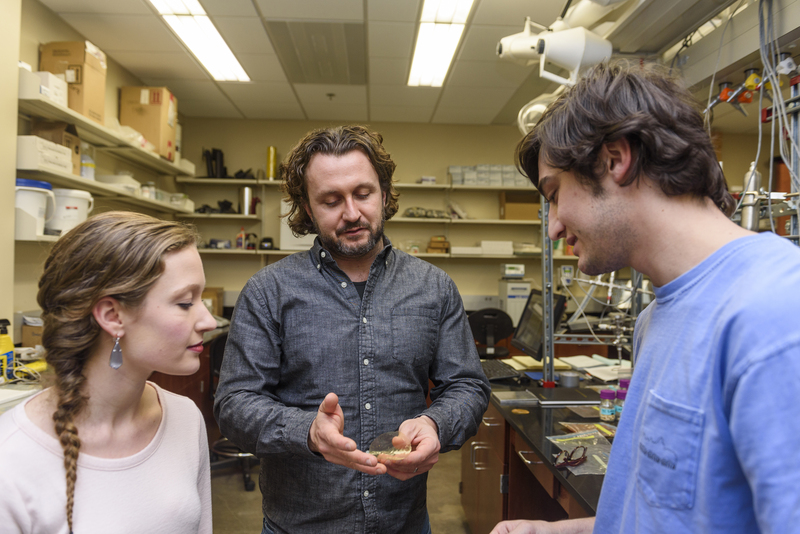 Dr. Jason E. Bara, center, discusses a membrane created in his lab with graduate students Katie O’Harra, left, and Grayson Dennis, right. TUSCALOOSA, Ala. — In response to future energy challenges, chemical engineers at The University of Alabama are creating new materials to more efficiently separate gases related to energy processes. Dr. Jason E. Bara, UA associate professor of chemical and biological engineering, was recently awarded a grant by the U.S. Department of Energy to further study the structure of these patented materials and investigate their functions as gas separation membranes to clean emissions or separate fuel and chemical feedstocks using a fraction of the energy needed for current methods. Dr. C. Heath Turner, UA professor of chemical and biological engineering, will work with Bara running computational modeling of the materials. In December, Bara and several of his students were awarded a U.S. patent for a class of polymers he called rigid, ionic polyimide materials, essentially positively-charged chains of repeating molecules. The novel material platform joins high-performance polymers with charged molecules, allowing them to form sophisticated structures tailored to an application. “Until now no one has created a charged polymer that follows this kind of formula,” Bara said. Membranes created in Bara’s lab join high-performance polymers with charged molecules, allowing them to form sophisticated structures tailored to an application. Currently, membranes are not yet widely used in these applications, but they have tremendous promise to compete with distillation and absorption, the two most widely used separations technologies for gas processing. “Separations cost a lot of energy,” Bara said. “Distillation columns, for example, are something most people don’t tend to think about because we don’t see them on a day-to-day basis, but they are a huge part of U.S. and global energy consumption from oil refineries to the chemical industry to ethanol plants. For now, though, Bara wants to understand how the materials interact at the molecular levels to predict their behavior while also identifying the most promising structures to use as gas separation membranes. The number of possible materials described by Bara’s patent is in the hundreds of thousands, so Turner will help model arrangements and behavior on computers to help Bara’s lab decide which materials to make physically. The University of Alabama, the state’s oldest and largest public institution of higher education, is a student-centered research university that draws the best and brightest to an academic community committed to providing a premier undergraduate and graduate education. UA is dedicated to achieving excellence in scholarship, collaboration and intellectual engagement; providing public outreach and service to the state of Alabama and the nation; and nurturing a campus environment that fosters collegiality, respect and inclusivity.